Double U strives to be the best at what we do. We put our customers above all else, from expert trouble shooting and unparalleled product knowledge to fast shipping and friendly service, we work hard to keep you in the woods. 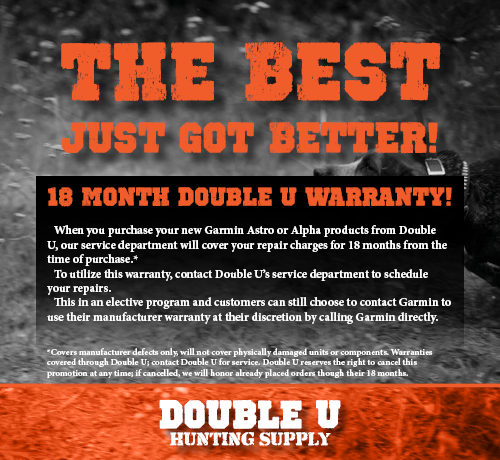 Double U is proud to announce our new 18 Month Warranty on all new Garmin Astro and Alpha products! For 18 months from the date of purchase, Double U will warranty all new Garmin Astro and Alpha products to be free of manufacturer's defects. This warranty works in parallel to Garmin's 1 year Limited Warranty and will be honored for the full 12 months offered by Garmin and an additional 6 offered by Double U. To utilize this service, warranty repair must be completed through Double U Hunting Supply. This is an elective program and customers are free to contact Garmin for their warranty issues if they choose. Utilizing this service is just as easy as ever! Give us a call and schedule a repair with with our service department, write us a note with your name, contact information, and a description of the issue you're having and ship your gear with the note and call us back with the tracking number. As soon as we have the tracking information we will ship out your replacement and the two will cross in the mail. Most warranty repairs will get back to you in just a couple of days! Like your manufacturer's warranty, this 18 month warranty does not cover physical damage, corrosion, water damage, or user error. This warranty is only through Double U Hunting Supply and will not be honored by Garmin. Double U will only honor this warranty on NEW products purchased from Double U Hunting supply. Used gear, non-Garmin products and products purchased from a competitor will not be warrantied. Double U reserves the right to cancel this program at any time; should Double U choose to cancel this program, we will continue to honor warranties for orders purchased prior to cancellation.